The new agenda of environmental sustainability is driving companies to think and behave in new ways and comes against a background of unprecedented advances in technology and rising consumption, with the world facing the twin challenges of climate change and resource depletion. External pressure from regulators and governments and an increasingly knowledgeable customer base have, of course, led many companies to introduce environmental policies – and for everyone in the building sector to increasingly seek “green” companies to do business with. However, the problem with much environmental practice is that it is driven simply by reducing carbon footprints – for example, using less energy in the manufacturing process and reducing pre-consumer waste. It is an environmental model of being “less bad” rather than “truly good.” However, importantly, it simply perpetuates a “cradle-to-grave” business model, where products that have reached the end of their useful lives are considered worthless. It’s a business model that the carpet industry has traditionally followed and, in terms of waste, makes for grim reading. Statistics from the USA suggest that carpeting is replaced on average every seven years, despite usually having a guaranteed life of between ten and 25 years. That means that a lot of perfectly good carpeting is thrown away every year, because it’s faded or just feels dated. That adds up to millions of square feet of carpet every year, and most of it is left to rot in landfill sites where it takes 50 years for natural fibres such as wool to break down, and 250,000 years for man-made fibres such as nylon to degrade. That’s a large number of years, and a huge wasted resource, when much of that material could be used again. According to a UK study carried out for the Contract Flooring Association, about 600,000 tonnes of carpet is thrown out in the UK every year. One estimate suggests that, in the developed world, some 2% of landfill waste is made up from old carpeting. Multiply those statistics across the world and you get a sense of the scale of the problem. It’s an issue that is now of real concern to the carpet industry, with all the larger companies voluntarily addressing issues of sustainability: taking old carpet materials back into carpet production, recycling old carpet into alternative products such as building materials and auto parts, and refurbishing old carpet into new carpet tiles. Despite the significant problems involved in collecting, sorting and transporting post-consumer carpet to be reprocessed, it’s a challenge that carpet and fiber companies are addressing, often working in partnership with entrepreneurial businesses which are creating local or regional carpet and textile collection sites, from which old carpets can, at least in part, be reprocessed. Nor is it a processing journey within the carpet industry alone. For example, polyethylene terephthalate (PET) plastic beverage bottles are now being recycled in their millions to make polyester carpet fibers. In a myriad ways, the carpet industry is positively addressing the environmental agenda, certainly in the developed world where production costs are relatively high, and the economic benefits of energy and waste reduction provide a valuable economic return. In other words, “thinking green” can be a good thing for the bottom line. Most corporate environmental journeys start with that approach: quantifying the carbon footprints, identifying ways of reducing it through minimizing waste, recycling, changing to renewable sources of energy, and setting incremental targets to improve performance throughout the manufacturing and distribution chains. But it isn’t a philosophy of change, merely looking in isolation at everything that a company does, rather than looking holistically at the entire business. Then we discovered a philosophy that did make sense. It models human industry on the natural world, in which materials are nutrients circulating in healthy, safe metabolisms. It’s a philosophy that uses nature as a metaphor for how we can redesign everything that we do – including manufacturing industry – to be more eco-effective. It brings a new methodology to the design of processes, products and services, by looking at raw materials both in terms of their intrinsic value and how, at the end of that product’s useful life, they can be taken apart and recycled – or “up-cycled” into products that may have a value and sophistication beyond that of their original use. Simply, it’s a philosophy of birth-to-rebirth. A birth-to-rebirth philosophy may sound deceptively simple, but it turns conventional sustainability on its head, because conventional thinking is all about a language of negatives. The green lobby talks about “minimising” human impacts, “zero footprints,” “banning” harmful substances or “reducing” energy use. This approach is, of course, better than doing nothing. But, effectively, what it’s saying is that adopting a “less bad” approach is inherently ethical. What a Cradle to Cradle® company says instead is that it doesn’t matter how much we manufacture, or how much “waste” we create because waste simply become the raw materials or nutrients for further manufacturing – with products being reborn and reborn. It’s a philosophy that looks at the world with a new perspective, because it doesn’t romanticise nature or demonise factories or manufacturing processes. It’s an approach that accepts that, in the modern world, we need to make things – and the goal should be to find ways that balance commercial activity with the natural world. To put it another way: the language of conventional sustainability says that we should hold onto products for longer – whether it’s a car or a mobile phone, and to therefore conserve the world’s resources. However, this approach only slows change, and goes against human instinct. After all, do you really want your laptop to last twenty-five years? Or to be using the same cellphone in a decade from now? Instead, Cradle to Cradle® makes planned obsolescence respectable. It encourages consumers to buy more products, but to do so from innovative companies that have policies in place to recycle old products, turning waste into new products or into nutrients. That closed loop philosophy doesn’t necessarily mean turning old products into identical new products. It means designing products that can be disassembled and used and used again in a continuous and virtuous cycle, where the intrinsic “value” of each component is preserved or enhanced. The Cradle to Cradle® philosophy therefore eliminates the concept of waste, and we are working towards a time when all waste or worn-out carpet becomes a source of nutrient, designing in features that allow old carpet to be entirely taken apart and reused. One aspect is particularly exciting, taking back old carpet, and underlines how much the carpet industry’s model will further change – and how it impacts on all Cradle to Cradle® companies. In some countries, a lot of old floor covering is incinerated in power stations – which is better than nothing. In others, it’s simply thrown into landfill, despite costing that company money to do so. What we’re saying is, give us the money instead, and we’ll turn your rubbish into new carpet. That, significantly, means that our customers won’t really be buying our carpet, merely paying for its use, with the materials remaining our responsibility. That is a huge shift in thinking for a manufacturing company to make but one, we believe, that offers an ethical model of how business can – perhaps, should – be done. 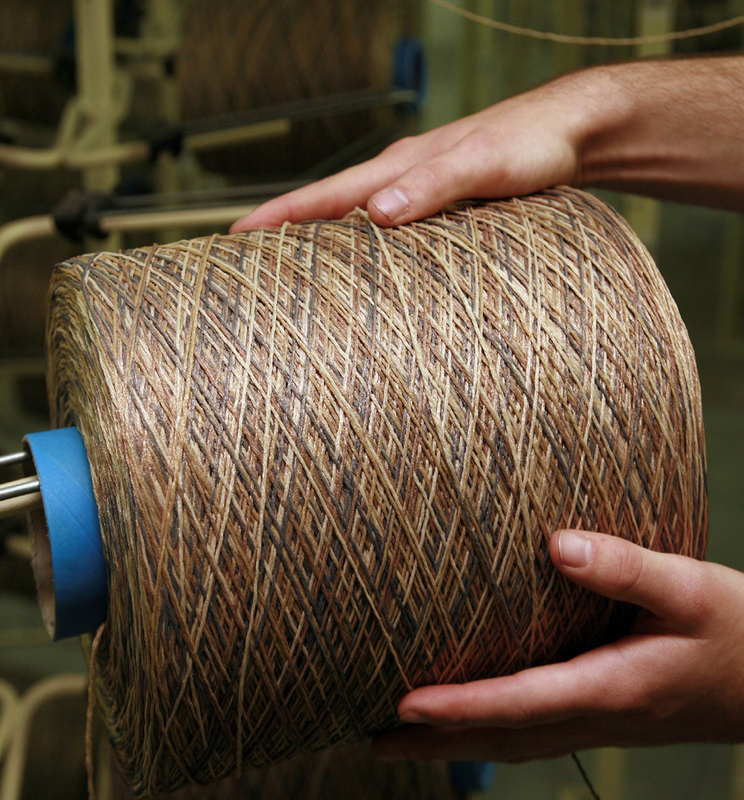 As a major manufacturer, we’ve championed Cradle to Cradle® at every opportunity. For example, I was in Cancun at the end of last year at the UN Climate Change Conference, listening and how governments and private industry could work in better partnership to deliver real environmental change. We’ve also been discussing those principles with governments and representative bodies such as the European Commission, and the reason why, certainly in parts of Europe, a growing number of government and municipal tenders must meet Cradle to Cradle® procurement policies. The important thing is that Cradle to Cradle® not only makes good environmental sense but is also good for business. It’s a business model that can work across the manufacturing sector, not just floor-covering manufacturers. It’s certainly a concept that is being embraced by more and more companies, and not just in Europe or the “old world.” Wherever I speak, from the Middle East to the Asia-Pacific region, it’s a philosophy that is finding increasing support. It’s a concept I would encourage everyone in the building sector to engage with because Cradle to Cradle® will, I believe, yet change the design of the world, and not just in the carpeting industry. Stef Kranendijk is CEO of Desso, a Netherlands-based manufacturer of carpets. Which Farm-Raised Fish Should You Buy?